Cayan provides you the benefit of cloud based payment processing which is reliable as well as efficient. RepairDesk allows its users to integrate with Cayan in order to grow their business. To know more about RepairDesk's partnership with Cayan please click here. Setting up Cayan integration is very simple. Let us show you how to do it in seven simple steps! How to Setup Cayan Integration? Just follow these steps and you are good to go! 2. In RepairDesk go to Settings >> Integrations >> Cayan. 3. Enter the Merchant Name, Merchant Site ID and Merchant Key on Cayan Payment Gateway Setting page. 4. Turn on the Cayan Genius device. Enter "0 0 0" (zero-zero-zero) three times, enter Cayan Genius password (9416557) and press the enter button. Note the IP Address. To know more about this step, click Here. 5. On the Cayan Payment Gateway Setting page in RepairDesk, enter the Device IP and hit Save. 6. Once you have successfully configured, please install root certificates for Firefox, Chroome or Safari so you can process a transaction. To know more about how to install Cayan Genius Root Certificates please click Here. 7. You can download certificates for cayan from here. The same certificate will work for Windows, iOS and Android devices. And presto! Cayan is integrated with RepairDesk. How to setup Cayan Certificates? 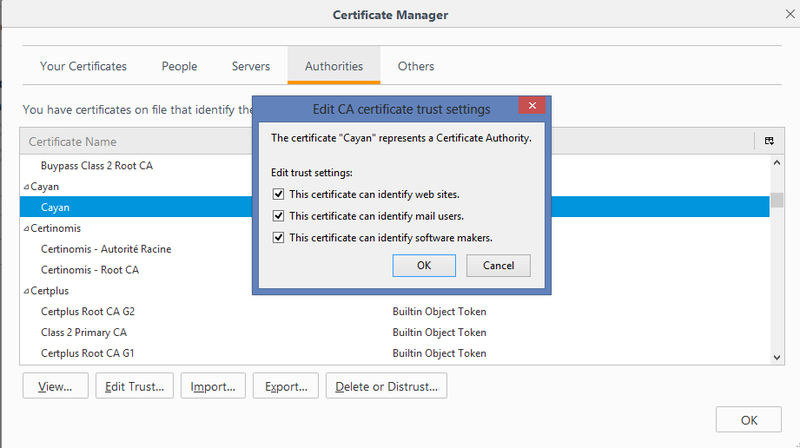 Some clients may face an issue with Cayan Certificate trust settings. To resolve this, we are providing below how to set up trust settings of Cayan Certificates in both Mozilla Firefox and Google Chrome. 1. Head to settings in Mozilla Firefox. 2. Go to Advanced Certificates. 5. 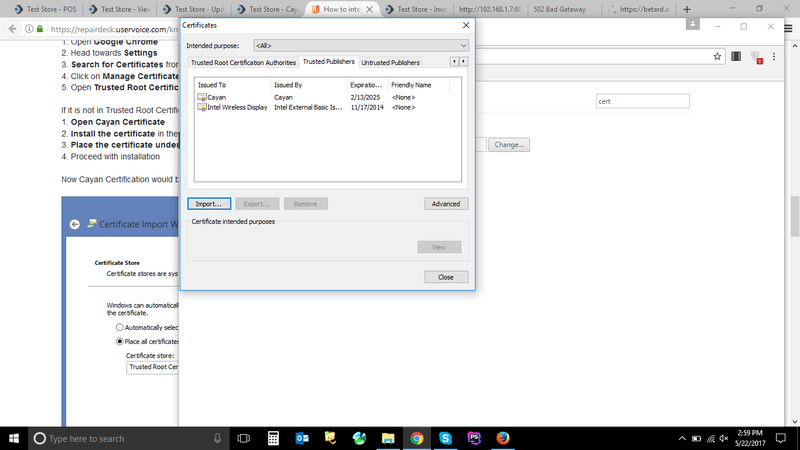 Edit CA Certificate Trust Settings and select all there check-boxes. 6. Finally, click on Save. 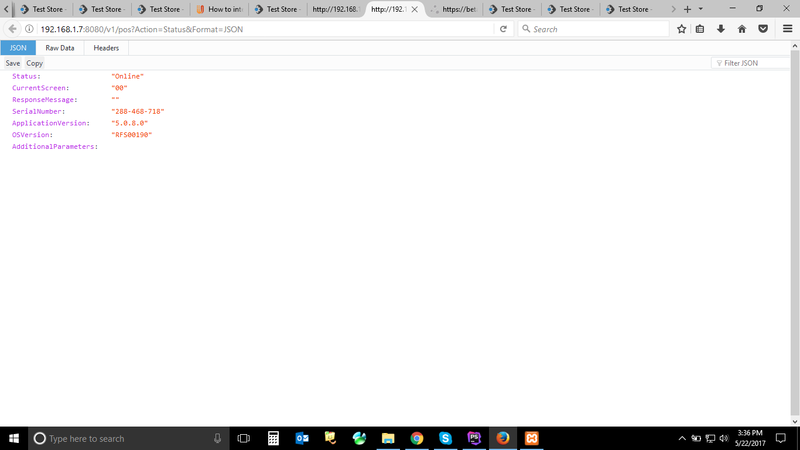 Now Cayan Certificate would be considered as a trusted certificate and you can run Cayan Integration smoothly on Mozilla Firefox. 5. Open Trusted Root Certification and see if Cayan is present there. 3. Place the certificate under Trusted Root Certification Authorities. Now Cayan Certification would be considered a trusted certificate by Google Chrome. In case if you're unable to see Cayan Certificates under Trusted Root Certifications, check them under Trusted Publishers. 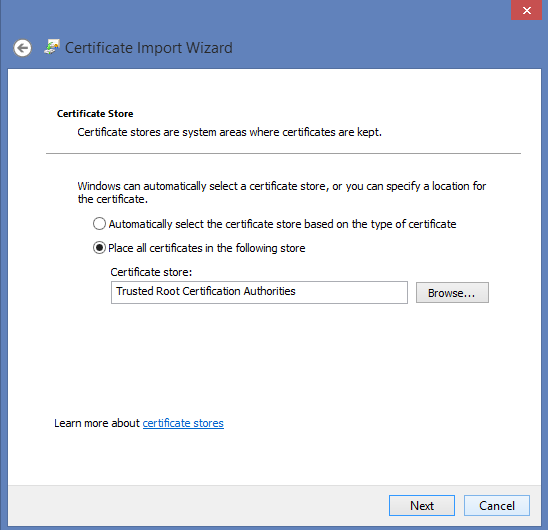 Import the certificate here, if it's not already appearing there. 3. Place the certificate under Trusted Publishers. Cayan works best when IP address for Cayan Genius is set as Static. In case of IP being Dynamic it will keep changing. In that case, you would have to match the IP in RepairDesk Cayan Integration and IP showing up on Cayan Genius Terminal. network administrator for the Genius device to connect to your router/switch. 2. On the keypad, hold down 1, 5 and 9 buttons together for two seconds, and then release. 3. Use the keypad to insert the password 166832 and press Enter. In case this password is not working, please contact Cayan Support. 4. On the tabs at the top of the screen, touch Administration and then Communication. 5. From the tabs at the top of the Communications screen, touch Network and then Ethernet. 6. From the Ethernet screen, touch the edit symbol next to Mode. 7. Select staticIP and touch OK.
assigned to the Genius CED and then touch OK.
9. Configure your subnet mask, Gateway and DNS settings. If the above mentioned steps haven't fixed your Cayan configuration already. then it's probably an issue with Cayan CORS settings. Please contact Cayan support and they will enable CORS settings for you. Q. How can I contact Cayan Team if I have a problem with my account? A. (844) 255-0561 is the dedicated phone line for RepairDesk customers calling into Cayan. Q. I have to configure Cayan integration again and again. What's the reason? A. Make sure that Cayan Genius device and RepairDesk are connected to the same internet connection. Also, it is advisable that the device IP should be static so that you don't have to set up configuration each and every time. Q. How to make a payment after I have successfully integrated Cayan? A. On RepairDesk POS after hitting on Checkout, select Cayan from the payment methods, select amount and click on Pay Now. The details will go on Cayan Genius device and you will get the following pop-up. Note: If during payment processing, you want to cancel the transaction, then you can do it by hitting Cancel Transaction. Approve the transaction, swipe the card and take customer signatures. You will get the following pop-up indicating that your transaction is approved. 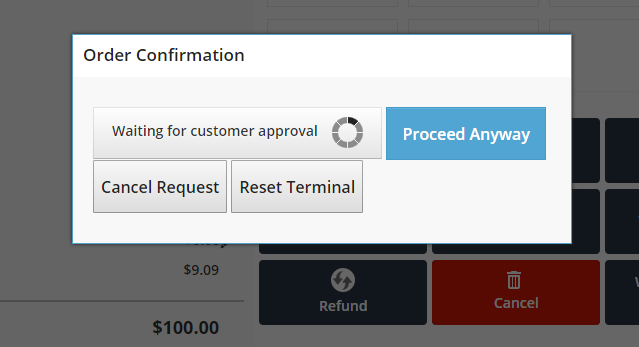 Finally click on Confirm on the checkout screen of RepairDesk. If you have forgotten to click on confirm, then you will receive the following pop-up. You can simply hit Dismiss to close this pop-up. Q. When can I cancel a transaction? A. 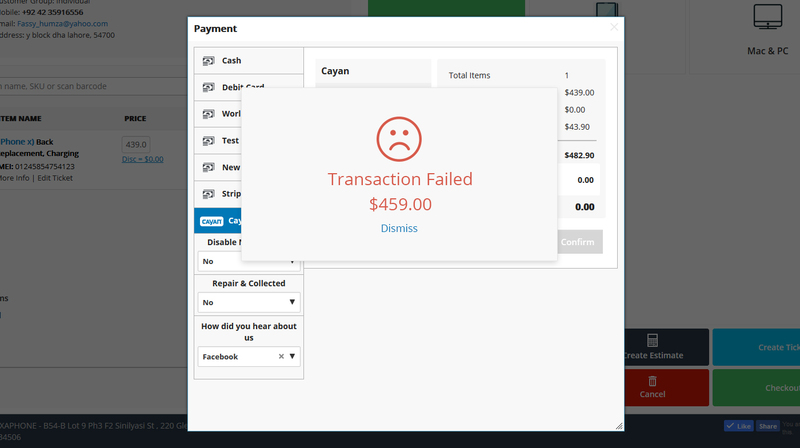 If you cancel the amount before swiping the card on Cayan Genius device, no transaction will take place and you can cancel it. If you have swiped the card but haven't taken customer signatures then it would still count as a signature but you would be notified that customer signatures were not taken. Note: You can also reset a transaction before making payment by hitting Reset Genius Terminal button on payment screen which will reset the transaction and you can go through the payment process again to complete the transaction. Q. What options are available with Cayan? Q. How can I apply for Cayan account? A. To know more and apply for a Cayan account, please visit here. Q. Can I take customer signatures? Q. Can I accept NFC payments such as Google Pay or apple Pay? Q. Can I use Cayan for payment via Invoices? A. No. You can use Cayan via POS only. Q. How can I process Sale with Cayan Genius Terminal? 1. Add an item to basket in RepairDesk and head to Checkout. 2. On Cayan Genius Device accept Terms and Conditions. 3. 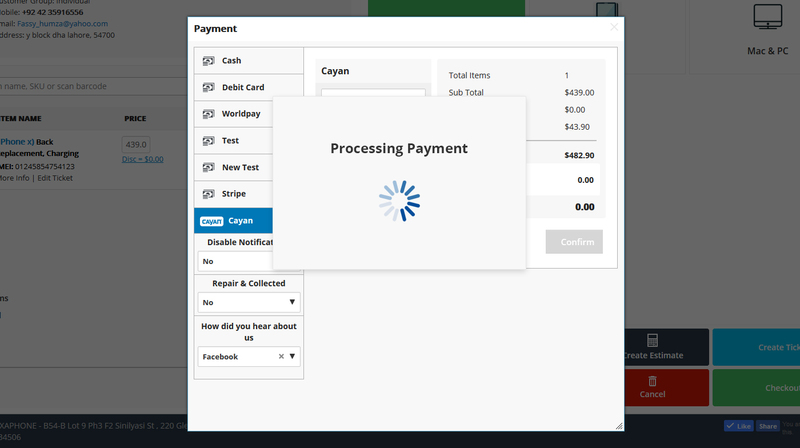 From Payment Screen in RepairDesk, select Cayan from multiple payment methods. 4. The transaction will appear on Cayan Genius Device. 5. Click on Pay Now on RepairDesk payment screen. 6. 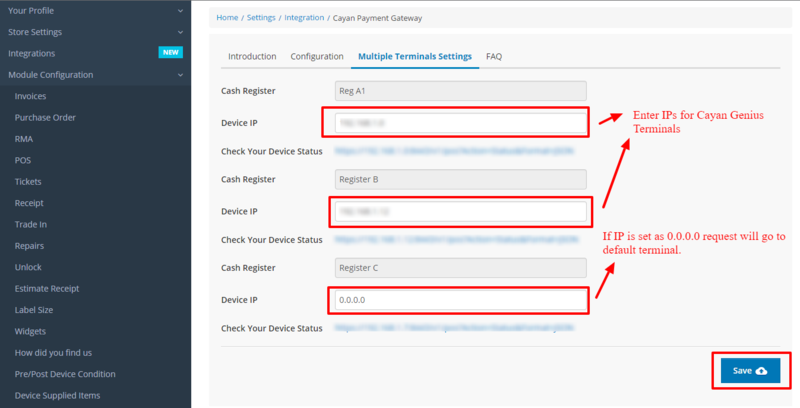 Select payment method from Cayan Genius Device. 7. If you're using credit/ debit card, swipe the card through the device. 8. Take customer signatures and click on Accept on device. 9. Payment through Cayan will appear on RepairDesk. Click on confirm to complete transaction. 10. Now if you view invoices, you can see the invoice for the particular transaction you've just made. Please see attached GIF for further clarification. Q. How can I process a Refund via Cayan? 1. Select an invoice you wish to refund and click on Refund button against it. 2. Items in invoice will be added to basket for refund. Head to checkout. 3. Add the amount which you want to refund to your customer. 4. Finally, click on Confirm to complete refund. Q. How can I approve a job order from customer while using Cayan Integration? 1. Go to Cayan Integration Settings. 2. Click on Configuration tab. 3. Activate the trigger: "Enable on Ticket"
4. Hit Save button to update settings. Note: You cannot use Cayan Genius terminal to accept customer signature along customer facing display integration. Also, give title and description under Agreement field; it should not be blank. Once signatures are enabled, you can take customer signatures for pre-repair and post-repair device conditions on POS as well as in ticket. Clicking on Cancel Request will cancel work approval from customer and you would have to send request again to take customer signatures. If there is already a request on Cayan Terminal, clicking on Reset Terminal will clear that to make way for new request. Q. How can I setup multiple Cayan Genius Terminals? 1. 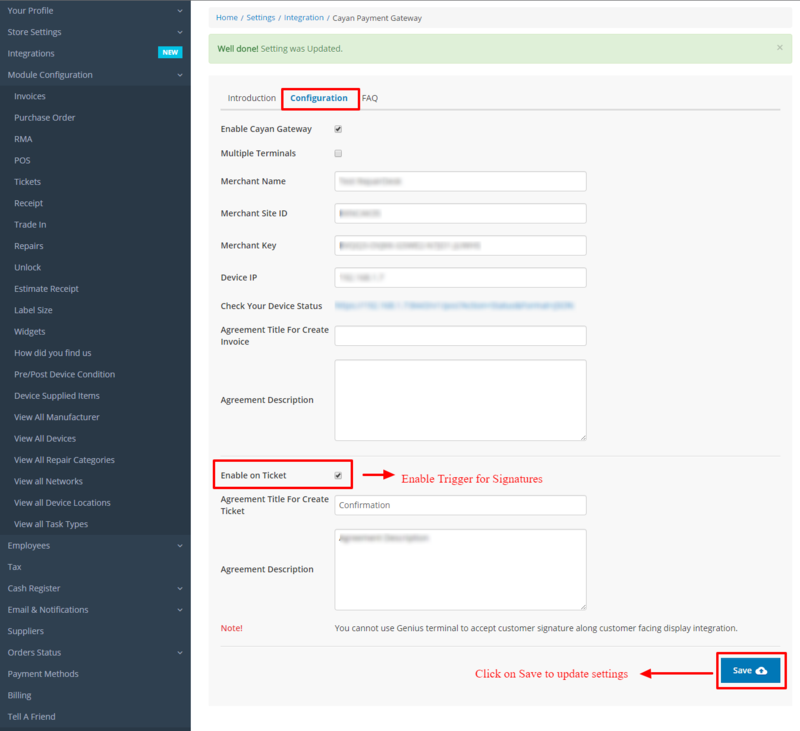 Head to Configuration tab under Cayan Integration Settings. 2. Enable the trigger "Multiple Terminals". 4. Now go to Multiple Terminals Settings under Cayan Integration Settings. 5. Cash Registers which you have already created will be appearing here. Set Device IP for Cayan Genius Terminals against these Registers. 6. Once done, click on Save button to update settings. Note: You can setup cash registers in the settings section of Repair Desk by going to Register Settings for Cash Registers under Settings.